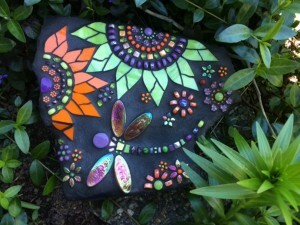 A dragonfly rock embedded in green foliage demonstrates Carol Deutsch’s skill at gently drawing radiance into a garden. With gardening season in full bloom, people are turning their attention to enhancing flower beds with interesting and other colorful accents. Garden art has always found a home plot around the Grays Harbor coast area. Beach driftwood carved or natural is ubiquitous. There are sculptures, mobiles, wind chimes, and mischievous gnomes peeking out from behind fronds. The role of light with water magnifying color into glinting, luminous iridescence is somewhat within the scope of an alchemist changing iron ore into gold. Ocean Shores resident and artist, Carol Deutsch, may not be the alchemist of legend but what she does with light, water and color is magical. 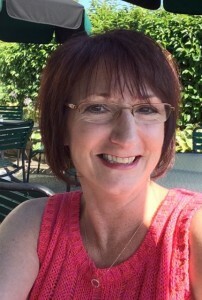 Carol’s art pieces have wend their way into the gardening world earning her artistic respect and high praise. Home and garden shows are also in bloom. Crowds flock to these events in search of the newest and latest ideas and items. 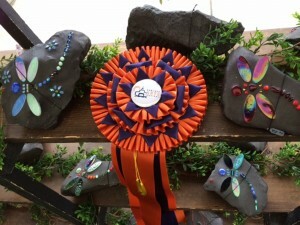 Looking at the show categories of available products, one notices “Garden Art” listed separately with the vendors and businesses displaying their current offerings. Carol’s Dragonfly Rocks is in the mix. Carol takes a deserved break from her busy artist’s life near her own garden where the inspiration for Dragonfly Rocks was born. If you look closely at a living dragonfly, such as the region’s Blue-eyed Darner, you can see why Carol predicated her many designs and business name on such a creature. The Aeshna multicolor is nearly 3-inches long. The male sports a shinny brown thorax with bright blue lines on each side, a copper brown abdomen, a black head and bright blue eyes. 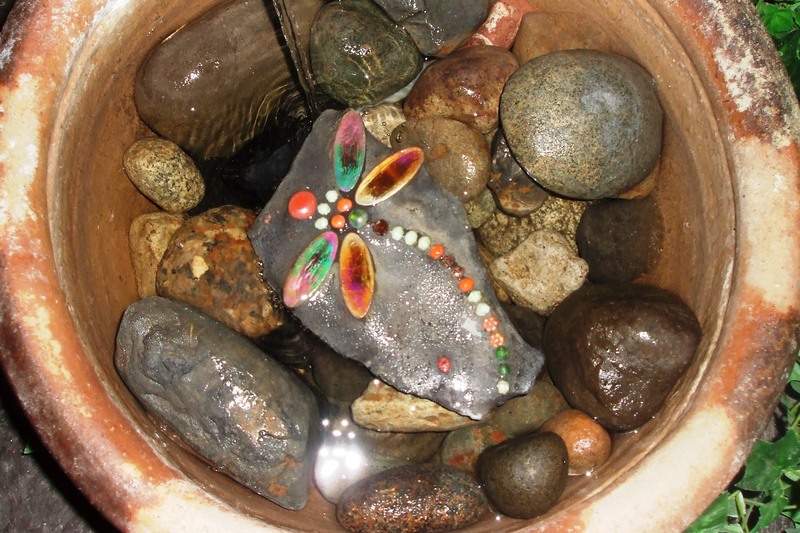 Water, light and an early dragonfly rock piece come together in this receiving bowl of an indoor fountain. It is no wonder the dragonfly is cause célèbre in the eye of flower gardeners. Their magnificent coloring, iridescent bodies and gossamer wings are suited for Carol’s artist sensibilities. She skillfully blends them with nature’s surrounding and elements giving her pieces a sense of movement. One of the main problems facing the artist working with color is successfully manipulating the pure hues of the light spectrum—red, orange, yellow, green, blue, indigo and violet. Carol has, through devotion to her craft nearly, if not wholly, mastered this dilemma. It all started for Carol on a spring day back in 2010 with an inspirational moment. The dragonfly concept came to her. Carol Deutsch is an award winning mosaic artist as bestowed here with a few of her acclaimed dragon rocks. While spending time in own her garden, she noticed a dragonfly in brilliant attire. Then following its aerial progress, it landed on a rock. Days later, in her home studio, she produced the first dragonfly rock. One project led to another and before long Carol was busy not only with requests for more dragonfly rocks, but also for butterflies, hummingbird and many more designs. The Dragonfly Rocks business took off with repeat customer orders and a growing number of collectors wanting to add more pieces of Carol’s work to their stock. 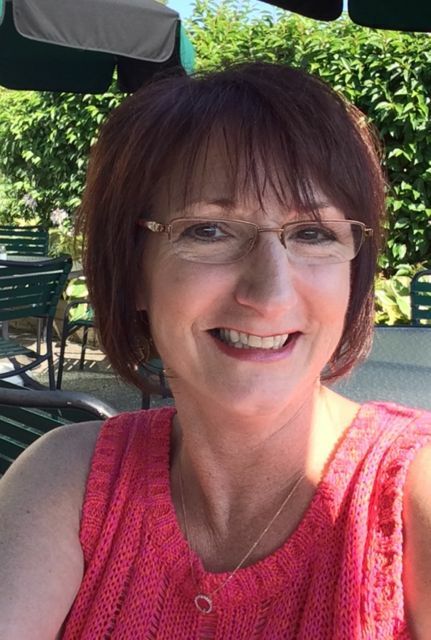 All this action eventually projected Carol into vending her creations in home and garden shows or arts and craft events around the Pacific Northwest. Carol has just entered the busiest time of the year for presenting her creations to the public. She is capping months of ongoing studio work preparing for the exhibition season. It is a constant process formulating new ideas, experimenting and producing a steady studio output assuring a solid inventory. The newest designs, Water Features, have been added to her line of available garden art. Water Features engage the ready displays of flora and fauna, with moving water. And where water and light converge, there might be the suggestion of a chimera from an otherworldly mythical, fairy-like region present but unseen in every garden. These rocks have a center flower motif from which water bubbles up and falls back down to create a rainfall effect overseen by the dragonfly. The water element, again, structurally plays light in accentuating the vitality of the piece’s colorful components. This is similar to the effect made when customers place their dragon rock in a garden pond or fountain where moving surface water interacts with the submerged piece sending rays of light back to the surface in masterful exchange. Whether put outdoors in a flower bed or on a house porch, this Dragonfly Rock’s message is the same. Packing up the inventory, traveling to multi-day events, setting up and meeting the public can be exhausting. Returning home begins the next show’s preparation. 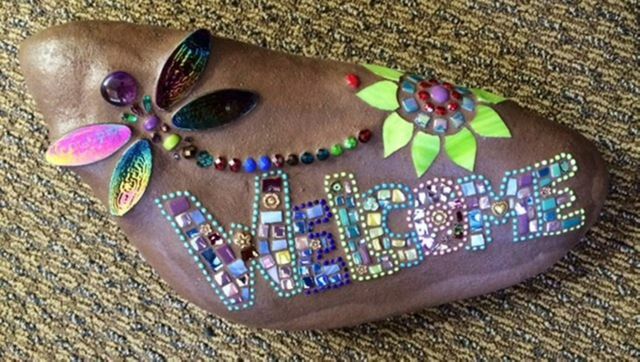 Through it all, Carol Deutsch remains dutiful in bringing this wonderful garden art to the public’s attention so that her dances of light might brighten gardens even more so everywhere. To see more of Carol Deutsch’s work, visit Dragonfly Rocks online. All photos courtesy Carol Deutsch.